Twelve-year-old Chen Le is a typical Chinese kid. He loves flying paper airplanes, plays Ping-Pong and dreams of becoming a scientist. And he aims one day to join the Chinese Communist Party (CCP) so, as Chen puts it, "I can puff out my chest and say I am a party member." The public school that Chen attends in China's southwestern metropolis of Chongqing was renamed the Red Army School earlier this year to pay tribute to the soldiers who gave their lives to the People's Republic. "I'm very proud of my school's new name because the Red Army soldiers were tough and had a strong spirit," says Chen, a little crimson kerchief tied around his neck. "I want to be as red as they were." This summer, China is awash in red. As the nation commemorated the 90th anniversary of the CCP on July 1, hundreds of millions of schoolchildren, officials, retirees and even top Internet executives joined voices to sing "red songs" praising the motherland. Cinemas have rolled out the red carpet for a blockbuster propaganda film about the creation of the party. Local governments have sent out text messages with pithy quotes from Mao Zedong, the founder of the People's Republic, whose Little Red Book of sayings has for years been mere flea-market kitsch. A Red Olympics with 200 teams was held with competitions like "Heroes Bombing the Bunkers" and "The Grenade Throw." Then there's the Red Army school program, which uses donations and other funds to instruct 1.15 million kids in academies named after the communist militia. "Our patriotism classes are even more patriotic than those of normal schools because loving our country is very important for our current society," says Fang Qiang, the secretary-general of the National Red Army Construction Project Council. 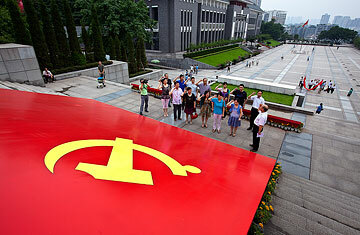 "Our students all have a warm love for Chairman Mao." Say what? Is this the same country that overtook Japan to become the world's second-largest economy last year, whose love of the free-market system has spawned thousands of books and created a whole industry of Western wide-eyed consultants? Indeed it is. Over the past three decades, the CCP may have replaced its founding revolutionary zeal with a turbocharged commitment to economic development; but the party has not managed to last for nine decades without a keen sense of survival. China's red revival might seem like a throwback, yet it is quite the opposite: a struggle for the future waged by the nation's leaders. As China's populace views its politicians as increasingly out of touch with a society beset by a widening income gap, the crimson tide is aimed at instilling pride in a country where there is no government but the party. "Looking back at China's development and progress over the past 90 years," said President Hu Jintao in his July 1 keynote speech, "we have naturally come to this basic conclusion: success in China hinges on the party." So that's clear. Leading the revival of attention to the CCP's history, myths, symbols and beliefs is an unlikely figure: Bo Xilai, party secretary of megalopolis Chongqing and the closest thing to a political rock star in China. In June, under Bo's directive, some 50,000 Chongqing residents flocked to a stadium to belt out red songs. Bo has replaced moneymaking commercials on local TV with red programming, and he has ordered cadres to the countryside to "learn from the peasants"  an echo of Mao's disastrous rural revolution. All this is somewhat surprising. Bo's father was a famed communist contemporary of Mao, but he was purged during the Cultural Revolution. Bo, now 62, is hardly a revolutionary: he favors luxury cars and suits and sent his son to Harrow and Oxford. Prior to becoming Chongqing's leader, Bo earned praise in Western capitals as China's Commerce Secretary, ready to deal with the outside world. He doesn't seem the obvious type to sign off on scarlet billboards across Chongqing that urge residents to "spread mottoes" and "sing red songs." But sign off on them he did. Look at China's political calendar, and a possible answer to the puzzle presents itself. Next year the CCP will begin a carefully composed, once-a-decade leadership transition as Hu and Premier Wen Jiabao ready themselves for retirement. As the jockeying for power gets under way, few want to be seen as anything less than loyal to a party that has ruled for 62 years. Bo has a good chance of being elevated to the hallowed ranks of the Politburo Standing Committee in the coming leadership reshuffle. His red fervor seems designed to help his cause. See pictures of the largest military parade in China's history.